The recreation of skiing, while a healthy and enjoyable activity, is often attacked on the grounds of ski areas being energy hogs, but they have been doing plenty that make them leaders among businesses for sustainable and renewable energy. This year’s winner of the small ski area category Golden Eagle Award was Berkshire East of Massachusetts. In 2011, the ski area added a PowerWind 56, 900kWh wind turbine and in 2012, formed a construction and power purchase agreement with AllEarth Solar, to build and use the electricity from an 1800 panel, 500kW solar tracking system. These additions, makes Berkshire East the first (and only) ski area in the world to be 100% powered by onsite renewable energy. They also installed 500 LED lights. According to the ski area website, they are applying for a grant to acquire a battery back-up storage system and a biomass chip burning system to burn wood harvested on site. Bolton Valley in Vermont has had its 121 foot tall wind turbine since 2009, annually producing 300,000kWh of power and generating electricity at wind speeds as low as 6 mph. The ski resort uses net metering for a price reduction on electric rates, and the energy produced is the equivalent of 45 Vermont households. The system was installed by Northern Power Systems. Ice on the blades does happen, and the turbine shuts off automatically when it gets iced, thus making the winter months the least productive for the wind turbine. Gore Mountain in North Creek, NY was recently awarded the SKI Magazine Golden Eagle for Overall Environmental Excellence based on the contracting of two 25-year solar power purchase agreements, which combine into a massive 5.325MW system. Using remote net metering, Gore Mountain will offset 85% of its electrical needs. In cooperation with Borrego Solar, there are 14,589 ground-mounted solar panels located on 20 acres of farmland. The agreement is projected to offset 113,919 tons of CO2, 71,634 pounds of nitrogen oxide emissions, and 131,835 pounds of sulfur over the life of the contract. Jiminy Peak Mountain Resort located in the heart of the Berkshires of Western Massachusetts constructed a 2.3MW community solar facility located on 12 acres of the ski area and resort’s property, owned and operated by Nexamp. 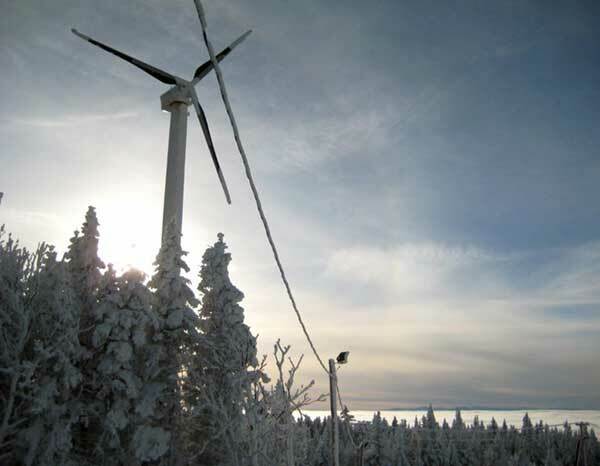 Renewable energy is not new to the resort – back in 2007 it was the first ski area in North America to generate power from its own GE 1.5MW wind turbine. The solar project significantly expanded Jiminy Peak’s renewable energy program, while extending the environmental and cost-saving benefits of solar to up to 200 neighboring homes and small businesses. By adding the solar power facility to Jiminy Peak’s existing wind turbine, 75kWh cogeneration unit, and extensive conservation efforts, the resort can claim to be one of the few resorts in the U.S. powered 100% by renewable energy and one of the most sustainable energy ski resorts. Killington’s numerous new solar power projects are slated to generate more than 3,300,000kWh of clean electricity annually for the resort and sister property, Pico Mountain. The eight new solar installations on-site at Killington and Pico will include fourteen AllEarth Solar Trackers which have been designed, tested and engineered in Vermont. The units use GPS technology to follow the sun throughout the day, allowing them to produce up to 45% more energy than a fixed system. The trackers, plus three new rooftop installations on the Pico Base Lodge, Pico Administration Building and Killington Golf Course Maintenance Building are expected to annually generate approximately 200,000kWh of clean electricity. In addition to the on-mountain solar installations, Killington partnered with Namaste Solar to develop four off-site solar farms within a short drive from the mountain. The four projects will generate more than 3,100,000kWh of electricity per year, which is more than 10% of the resort’s annual usage. The electricity produced from all solar initiatives would power 370 homes annually and conserve 2,471 metric tons of CO2, according to the EPA’s Greenhouse Gas Equivalencies Calculator. The Cow Power program is a unique form of producing energy whereby about a dozen Vermont farmers use cow manure at their farms in an anerobic digester system to generate electricity to sell to Green Mountain Power, and Killington purchases 1,125,000kWh annually of this energy to power the K-1 Gondola and the Peak Lodge. Their most recent initiatives include three eighty gallon heat pump hot water heaters for the eight bedroom inn, cold climate heat pumps installed in the whole inn for both heating and cooling and a conversion of the gas-powered, zero-turn lawn mower into an electric mower. Craftsbury Outdoor Center in Craftsbury, VT has incorporated sustainability in its mission statement to be carbon-neutral. They use eight tracking solar panels for 35% of their electricity, highly efficient wood-fired boilers for heating, and a solar hot water system. At Craftsbury Outdoor Center everything is net metered with 32kW on the trackers and 3,000 square feet of panels on the roof, supplying the Activity Center with close to 70kW. Between the two, that provides 63% of operation’s electricity, and there is also solar thermal to provide summertime domestic hot water, which is supplemented with heat pumps. Craftsbury has incorporated massive amounts of insulation into all of the new buildings and locally sourced many of the wood products used in the building construction. The roof of the Activity Center is at R72 and the walls are R46. High efficiency wood gasification boilers provide all of the heating and domestic hot water demands during the cooler months. They are tied into the 10 million BTUs of thermal storage in the form of 20,000 gallons of water. This storage system allows them to cogenerate with the snowmaking generator, providing electricity for the pumps and guns, and catching waste heat off the engine. Previous Post: « Who Needs XC Ski Lessons?